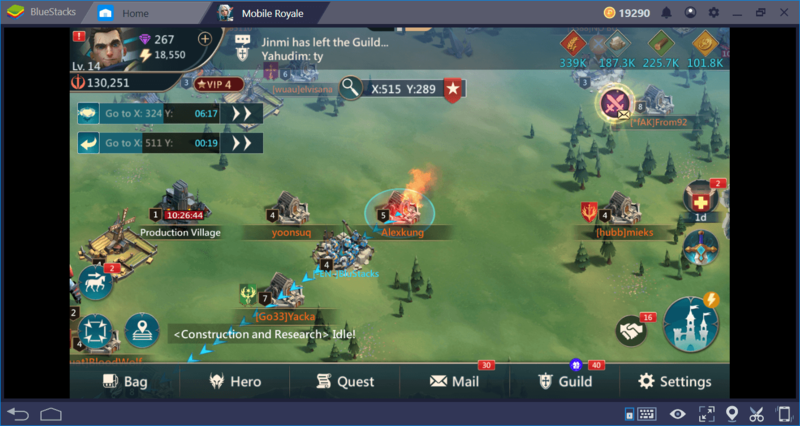 Mobile Royale contains advanced battle mechanics like all other conquest games and if you want to have a powerful kingdom, you need to know all of them. However, this is not an easy task – many different functions that support each other are used in these mechanics, and it all takes a long time to learn how they work. With this guide we have prepared for you, you can shorten this time and become more effective on the battlefield. Let us begin, my lord, our dragon is looking forward to joining the battle! There are two types of targets you can attack on the world map: The monsters and other players’ kingdoms. 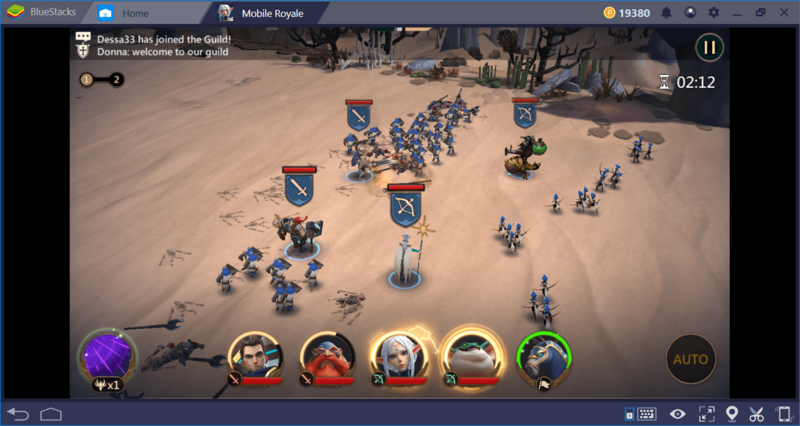 There is no difference in the mechanics used; first you select the target, then the commander, and finally you determine how many troops you will use for that attack. The most important thing you need to pay attention to while attacking other kingdoms is the “might points”. We mentioned the might points in another guide: Don’t attack a kingdom with more points than you, because you’ll probably lose that battle. 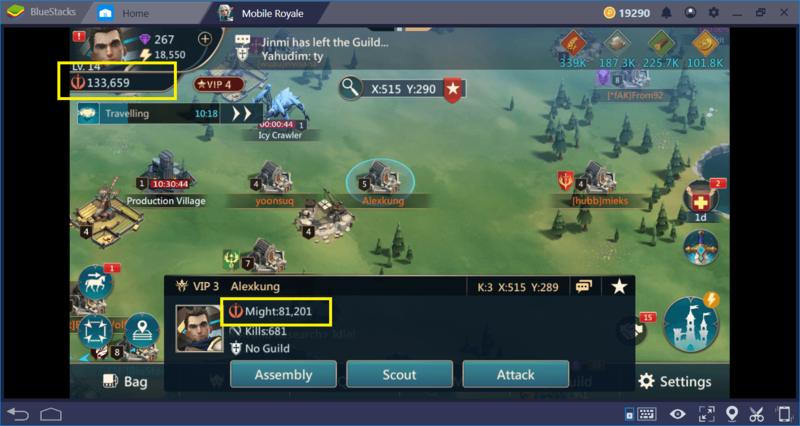 In addition, it is always a good idea to use the scout option before attacking a kingdom: This way, you will have more information about enemy forces. The world map. You can see examples of targets you can attack in the screenshot. The Monster Hunt screen. You can see the rewards you will receive at the end of this battle and the energy points you need to spend on this screen. If you attack a monster multiple times, you will get a DMG boost. 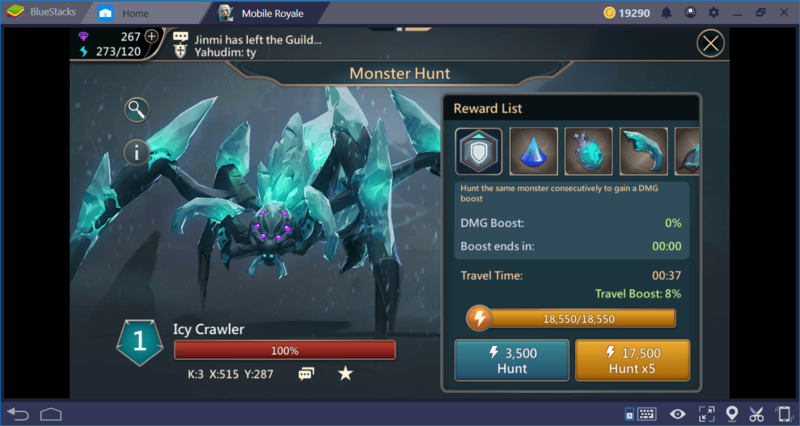 Note that you must join a guild to use the Monster Hunt feature. We are about to attack this kingdom, but we will learn more about it with the scout option first. Our opponent’s might rating is 81.201, ours is 133.659 – we will win this battle. The last screen before an attack. Here, we can determine the size of our army and which commanders will lead the attack. Don’t use your entire army in any attack, and make sure you have enough troops in your kingdom for defense. We won the war and we are returning with the spoils: An important part of the enemy kingdom’s resources is now ours. This was a weak kingdom, so we could only win gold. Well, maybe we will be luckier next time. In order to have a strong army, you must give importance to troop training and management. 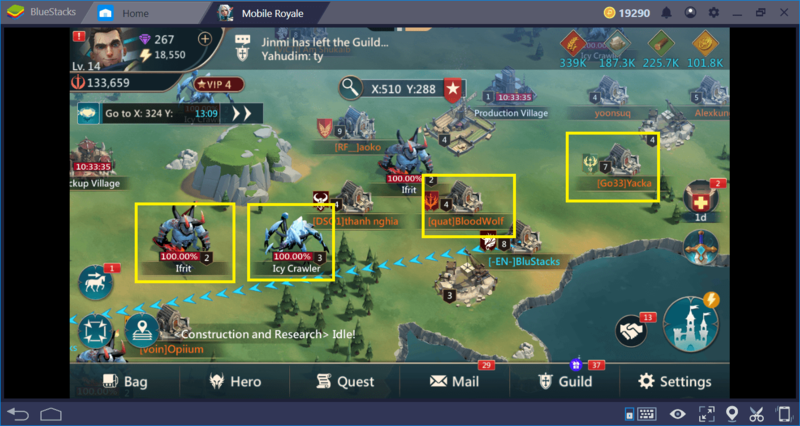 As with other conquest games, there are multiple types of troops that you can train, but you don’t have to construct different buildings for them. In other words, you don’t have to use a different building for the archers, and another one for the infantry. 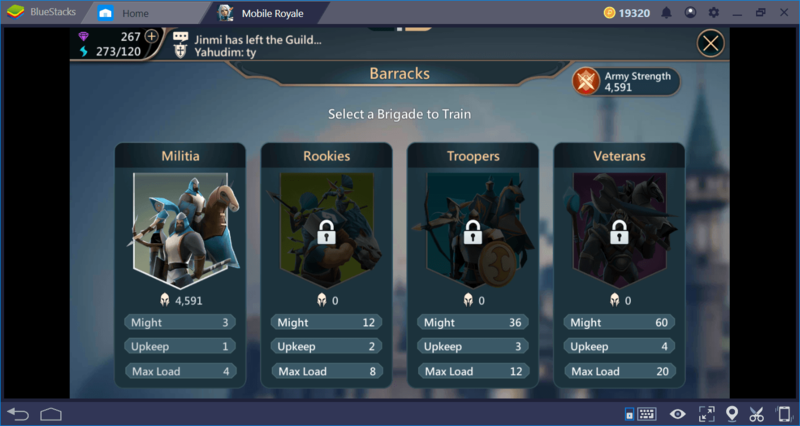 By building a single barracks building, you can train and upgrade all troop types in your army. 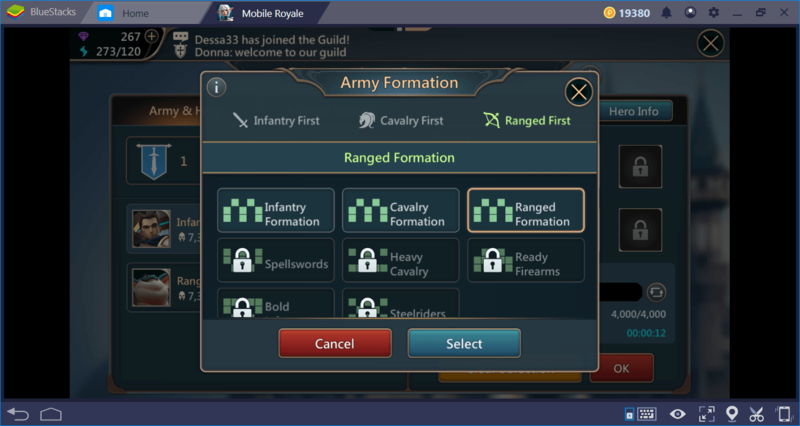 Mobile Royale troops are divided into three basic categories: Infantry, cavalry, and ranged. There are different types of troops under these categories, and you can upgrade each of them. Archer units, for example, become “javeliners” after upgrading and all of their base stats increase. To upgrade the troop types, you must first complete the relevant research in the “Sage Tower” building. What is important here is that you cannot train a single type of troop. So, for example, you can’t just train archers: You can place production orders on a category basis. In other words, you can only train “militia”, and by doing so, you get three different types of troops: footman, horseman, and archer. 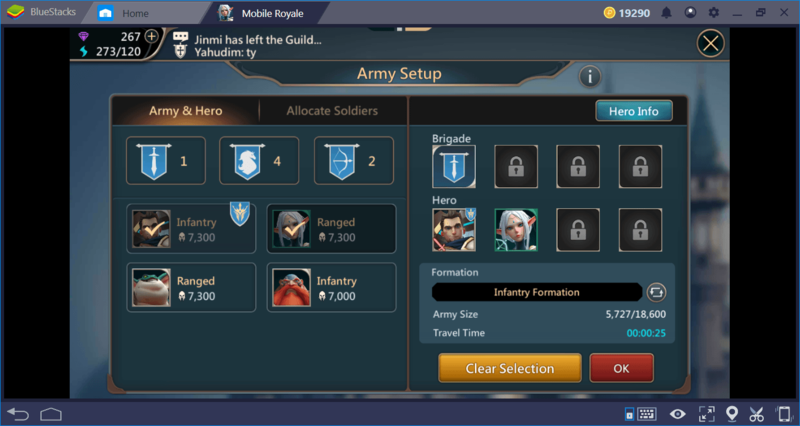 Mobile Royale gets rid of many micro-management features when it comes to troop training and allows you to focus on the big picture. To increase the size of your army, you must upgrade the barracks building. 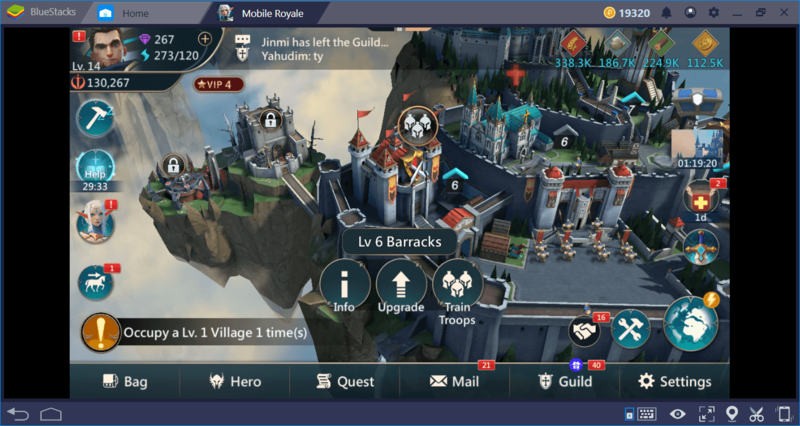 As mentioned in our guide on buildings, you can upgrade barracks to level 25 and increase your training capacity to 25,000 troops. 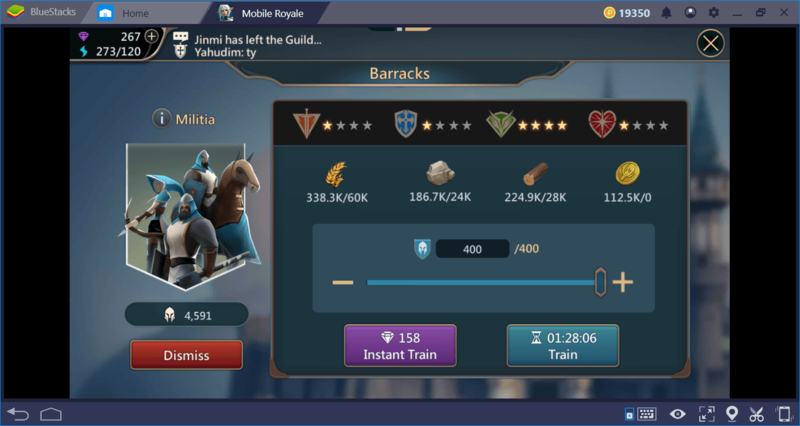 You don’t have to train millions of troops in Mobile Royale: An army of 5,000 will be enough until you reach the mid-game phase. In the end-game phase, an army with 20,000 troops will be enough for almost every event. You can decide which units you need to add to your army based on the result of scout reports and this list. Likewise, you need to determine the formations and which troops will attack first. For example, if the number of cavalry in the enemy army is high, you can gain an advantage by choosing ranged formation. The battles on the world map do not have a separate interface – once the army has reached its target, the battle takes place automatically and is completed in a matter of seconds. At this stage, even if you want, you cannot perform any management tasks or give new orders, for example. 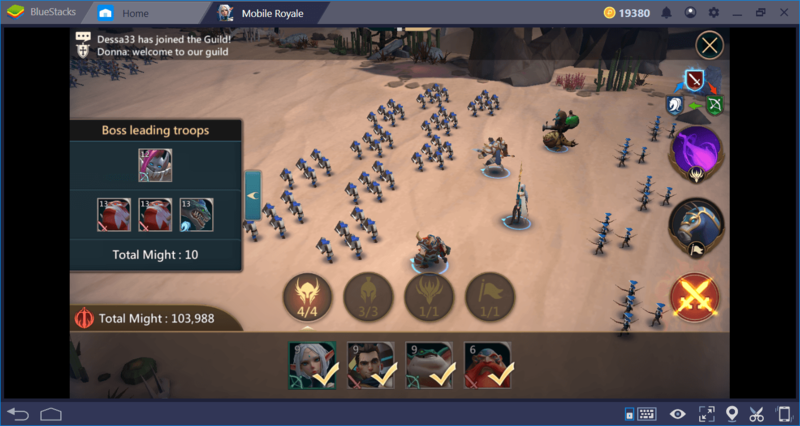 But in PvE missions, you can manage the battlefield and give orders to your army and your heroes. First, let’s look at what this screen looks like. Battle preparation screen. You choose the troop types and commanders on this screen. Make sure that no slots are empty. Pay attention to the bottom of the screen. On the far left, there is the special skill of your dragon. If you click it, your dragon will make a highly effective AOE on the battlefield. When the rings over the portraits of your heroes begin to shine, you can use that hero’s special ability. The horse symbol at the right represents the support forces that you can call on the battlefield. You must manually place the skills of your heroes and determine the spawn point of your support forces. However, by activating the “auto” option in the lower right corner, you can also automate this job. If you are struggling with a particular battle, increase the levels of your heroes and try again. Unlike PvP battles, PvE battles give importance to the power of your heroes, instead of your army. 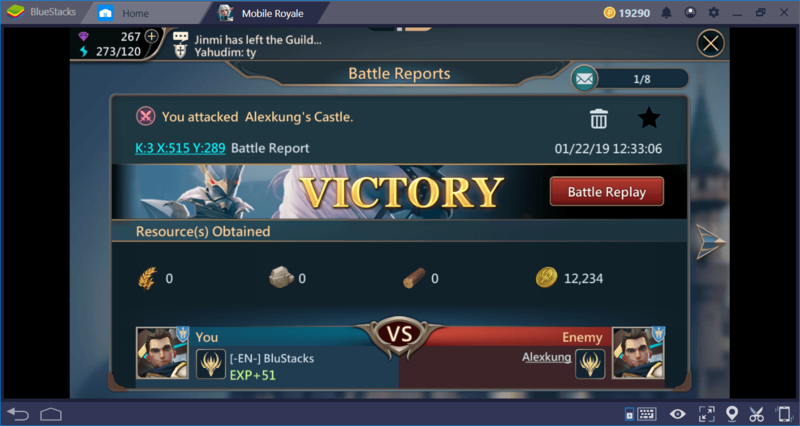 So, even if you have a small army, you can easily win PvE battles with high-level heroes. 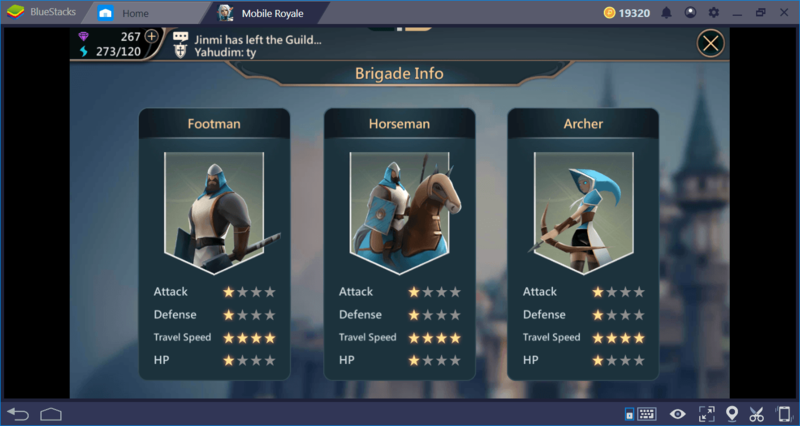 These are the most important things you need to know about Mobile Royale combat mechanics, but you can learn some additional tips by reading our other guides. Speaking of which, don’t forget to take a look at our leveling guide as we explain how you can make your heroes stronger. 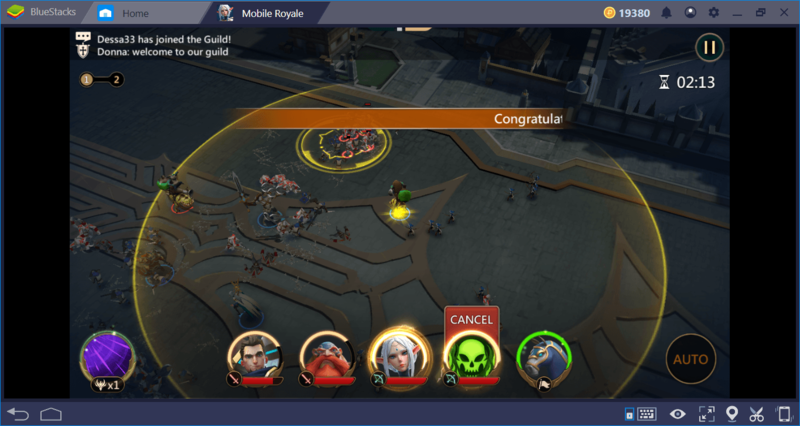 Now, you’re ready to take over the world of Mobile Royale: Good luck on the battlefield!